Every day is a new beginning. Treat it that way. Stay away from what might have been, and look at what can be. I just came across an interesting feature that I think is new, or at least new to me, on the Indy Star site. 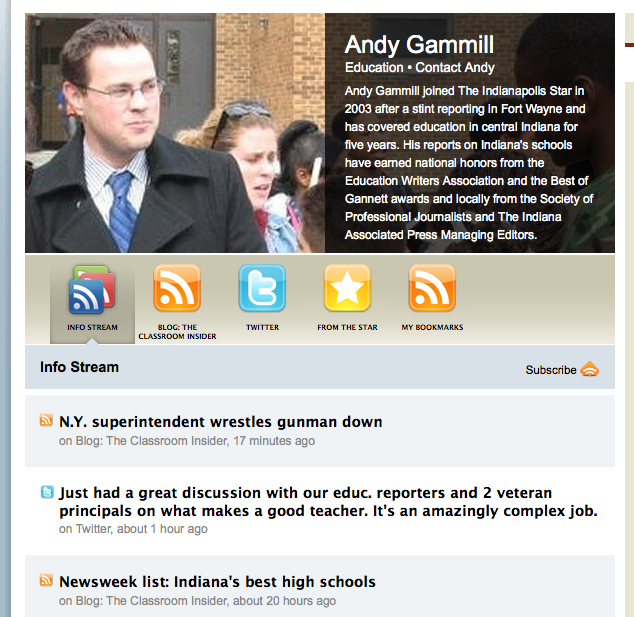 Scanning the education section of the site, I noticed under the refers to education reporter Andy Gammill’s blog and twitter there was a new link: “Andy’s info stream.” I think it’s new because I look at this page almost daily (Indy is the largest paper in the state and the J&C’s sister paper), and I have never noticed it before. Pretty cool if you’re interested in what the reporter is writing, reading, working on, blogging about, twittering about, etc. I tried to find similar pages for other reporters on the site, but I didn’t see any even for other blogging & twittering reporters, like their politics columnist Matthew Tully. A quick Google search turned up a page for racing reporter Curt Cavin and music reporter David Lindquist. Lindquist’s list even includes recently played tracks from last.fm, which seems like a neat addition for his beat. Other papers have pages set up about the reporter, with links to recent bylines, etc. But this is the first I’ve come across that compiles essentially everything that reporter is already doing and puts it together on one page. You can even subscribe to that reporter’s info stream. It reminds me a lot of friendfeed, where the reporters could pick what they want added (i.e. their blog, twitter, bookmarks, music, etc.). Except it’s sleeker and it’s hosted on the news organization’s site. As a reader, I find this information fascinating. At least for Andy’s stream because he covers the same topic as me and often writes about things I’m also writing about. I already subscribe to his blog and follow him on Twitter, but for readers who don’t want the hassle of subscribing and belonging to tons of services or who just want a clean interface to quickly see what the local reporter is doing, this could be a cool tool. And once the widget (as this appears to be) is set up, it’s not like it takes a lot of work to keep fresh. The reporter is already producing the content to go there daily. On the other hand, I can see how some reporters would be apprehensive about a feature like this. Most print reporters I know (columnists excluded) didn’t get into this business to be a personality, which is what this feature kind of creates. And even if all the feed pulls in is information you’re already posting, I could see their unease at their online life being aggregated like this for every reader. However, because I think the news train is headed in the opposite direction of such reporters — who are also the hold outs refusing to see the utility of blogging and twittering or trying such tools for their beats — I don’t feel bad for them. In my case, all this information is already out there. It’s already mostly streamed on friendfeed, Facebook and Twitter. So I think this feature is pretty cool. It will be even cooler when they get a list of all the reporters posted. It also would be great if you could pick which of those reporters streams you wanted to have all appear in one mega info stream (like the people you follow on Twitter — I could pick the education and politics people but leave the sports folks behind), or if you could see what everyone at the Star is saying/reading/blogging all in one time line (like the public time line on Twitter). It might be pretty telling about the organization en masse. I first saw the coverage Kent News Net had of the riots at Kent State this weekend on Twitter. My immediate reaction was, “come on guys.” Not about the newsroom, which was pumping out updates at rapid-fire pace, but about the future alumni of my alma mater. People already associate the school with police (err national guardsmen) in riot gear. But at least they were fighting for more than the right to party obnoxiously. My next thought, when I clicked through and checked out the Web site, was, “wow, these kids (that would be the Stater/TV2/BSR reporters) are doing an AWESOME job covering this.” The page was — and still is — decked in videos and photo galleries. The Kent Police Department would not make a statement Saturday evening, but student journalists at the Daily Kent Stater and KentNewsNet.com were out in full force, covering events on their Web site and updating the community regularly on Twitter (http://www.twitter.com/kent360.). Kristine Gill, editor of KentNewsNet.Com, said she and others went to investigate after seeing flames from their office at Franklin Hall. ”The flames were filling the street, like 15 feet high, and kids were throwing furniture on it and hanging from trees and screaming ‘KSU’ over and over again,” she said. She said students told her the fire was started because police were harassing students on their front lawns and firing rubber bullets. Gill said some students showed her welts. This is exactly what Twitter can be and should be used for in the news media. It’s not the only thing Twitter is good for, but with this coverage they have proven it’s a great tool and likely turned many new skeptics into converts. I just wanted to take this space to highlight the awesome work of these student journalists. I knew it was coming. And yet this weekend, when I pulled up one of my stories and saw it was split into two pages, I was still annoyed. I read enough newspaper Web sites to have noticed over the past several months a trend was spreading among the other Gannett papers using the corporate template. Specifically, those GO4 sites now (or if they don’t already, will) sport a “Next Page” link at the bottom, just above the comments. I would be annoyed by this anyway because it requires more work on my (the reader’s) part. It also tends to have the same effect on me as on John Gruber: I must have some weird strain of dyslexia. Whenever I see a link named “Next Page”, I think it says “Stop Reading and Close This Tab”. As a writer, I’m bothered that beyond about 350 words now my stories will likely not be read. In print, we have limits on how many stories can jump from a section front because they say research shows people don’t follow the jumps. I’ve already been working on tighter writing, but sometimes it takes more than 350 words (~ 10-12 inches) to make a point. And usually the stories that flow longer are the most important stories we write — the enterprise we work hard to nail. Why would they follow the jump online when the pages take quite awhile to load because they are bogged down with so many ads, scripts, images, etc. Who wants to reload all that junk three times for information they may (I hope do) or may not find useful? For example, I ran a story I wrote today about money saved through field trip cut backs through a page load test. It timed out! But take a look (here is a PDF of the test in case that link is broken) at how much it loaded before that time out. It was 30.1 seconds and 80 objects in before it gave up. That’s an individual single story without any comments on it. The home page has much more going on, and when you have multiple pages of comments on a story, that adds to the load time as well. I have a cable connection and it still takes awhile to load. I can’t imagine how some of our users still on dial up or who have DSL at best suffer through the load times. But I can guess: They don’t. Here’s what makes this move even sillier than I’ve already pointed out: The entire story is loaded on each of the pages. So, they’re adding a few extra elements and seconds but not even trimming the extra crap that doesn’t appear on that page. Now for the disclaimer. I do like to be paid. I understand there is a relationship between ads displayed and money made. So, I guess this is a gimmick to get more page views and inflate page counts. But there comes a point where that is counterproductive. And I think the sites, already teetering on that ledge, didn’t need this shove. (I have an ad blocker at home anyway. See my past discussion on what Web site “feature” pushed me over the edge on that.) I have also come to terms with that reasoning being the same as why my stories appear juxtaposed against “after hours” galleries of bar-hopping snapshots. Actually, I haven’t come to terms with that either, but it’s a discussion for another day. Was my workaround until I posted my annoyance about the page jumps on Twitter and found a new hero: Matt Busse. He pointed me to a script he created that puts the whole story on one page. So it turns out the fact that all the story is loaded in one page is a good thing. It meant this script was possible. So that’s my solution for now. Unfortunately, it isn’t something that will get widespread use, and it’s not exactly something the sites will publicize. So my real solution will just be to try and keep every story I write within 350-400 words to try and avoid annoying readers with a page jump. That isn’t necessarily a bad thing, but it will be challenging for me and mean some important information or anecdotes don’t make the cut. And, it will be counterproductive to displaying ads. So we lose in the end anyway. I started an education beat blog for the Journal & Courier in January. It’s something I’ve wanted to do for a really long time. Two years in, I now feel I have a strong command of my beat. I also feel I can handle both my normal workload and the added work of the blog without diminishing my daily work. Even though I knew (and know) it is more work for me, it is something I think will improve my beat and my coverage. So in my annual review this year, I really pushed for it. After some discussion with editors, showing examples of other education beat blogs and explaining my ideas, I got the go ahead to try. The first few weeks were just be me testing the waters. I’ve kept blogs before (obviously), but this is a bit different both for me and for the J&C. While we have a handful of staff blogs (mostly sports), we do not have any news reporters blogging. Until now. Obviously, the test was “live” because it was through the Pluck system on jconline. (Pluck barely qualifies as a “blog” except in concept, but it is what we’re working with, and although it hinders easy access, I’ve decided it’s doable. I think.) But it wasn’t put on the staff blogs page or promoted in print until last week. The editors dropped it in a couple of the print “more online” refers. I highlighted it in a breakout on my weekly schools page. And in Sunday’s paper, I talk about it in a Q&A on the opinions page about my beat and new blog. Q:Tell us about your new blog. I have no idea if anyone else has looked at it. No comments yet. But actually, I did get one reader who submitted a message to my profile with a story idea that I looked into and posted a blog post about. Then, when the Indiana House voted on the bill, I turned it into an A1 story. I would have learned the provision in the bill eventually, and did get notes about it a day after my initial blog post, but that person tipped me off a little earlier. It takes more time than I expected to write up a post, including appropriate links/files, etc. Since my regular workload remains the same, this is one of my hindrances. But for those posts I later turn into a story or a brief for print, it reduces the time needed to write the pieces. I have a long way to go to put this into my “routine.” For now, it’s more an afterthought than where I break news. (If it’s true breaking news, then I’m breaking it on the front homepage where more people will see it.) So far, my posts have come first thing in the morning, around lunch, when I’m waiting on a call back, when I’m done filing for the night … basically when the urge strikes. I also need to figure out what to post/not post and make it regular. This is hard because my schedule is pretty unpredictable. However, I think if I started a few regular features, they would give me something to post even when news is slow. It would also make it harder for me to ignore the blog when I get busy, which has been a problem so far. Pluck, the social media program underlying all Gannett sites and which our staff blogs run through, is not at all user-friendly. Not for the blogger nor the reader. You can’t, for example, just write HTML code for a link or to make something bold/italic. You have to actually highlight and paste in your link using its form. This slows me down because I usually just write the HTML as I write the blog, without stopping. You also can’t just drop in a YouTube video or a google spreadsheet. It does let you upload some things, like images, but it’s very limited WYSIWYG. That makes it easy for a regular person to start a blog on the site. It makes it maddening for an experienced person. There is no spell checker on the blog form. Since the posts don’t go through an editor, this is kind of an important feature. I have to spell check it in another program or site. Even the automatic spellcheck on Firefox doesn’t work on the site for some reason. I could write the post in another program, but then I have to go back in on the site and format the links/text. There’s no easy way to point people to the blog. Pointing to a specific post is even more challenging. So far, what we’ve been doing is just referring people to the jconline.com/blogs directory. That works, OK. Except, then they have to find my blog (the second one listed for now). Then, even though the most recent three posts are listed, whatever they click takes them to the main page of the blog. And finally, from that page, they can actually click to read an entry. One entry at a time. I get that each of those are page views, but seriously, how many newspaper readers would follow three jumps for a 200-word story? I suspect even fewer will follow those jumps online. Each post is its own page without context in reference to other posts. The main page is like a partial RSS feed: You see the first few sentences but have to click to see more. What’s more annoying, however, is that the posts themselves are standalone. You have to click to see them, then to see another one, you have to go back to the main page or click a recent post in the sidebar. There’s no “next” or “previous” and no way to see multiple posts on the same page. Again, this has to do with page views. But I tend to think ease of use will get someone to load more pages and stay longer, rather than get annoyed with an unwieldy, unintuitive interface. Only the most recent 10 tags are shown. If you look in the sidebar, you can click on the most recent tags, but not any others. This is complicated for me because I want to make sure I’m using the same tags to make them useful. But it doesn’t recommend tags I’ve used in the past or have a list where I (or readers) can look specifically for that tag. This is a problem because I cover more than two dozen districts, with multiple schools. I want people to be able to find stories specific to their community. I haven’t figured out an easy way to do this yet. The RSS feed seems pretty good. I would like some of the tracking and social media features feedburner (Google?) offers. But the feed works and includes — Thank you! — full posts. I’ve been able to drop things on the blog before I could get the story out and also things I will never print. For example, the post about an anonymous $1,000 donation for impoverished kids and about schools continuing without power. I’m trying to limit these to things people might actually be interested in. I don’t want to bore the potential readers with process, but I do want to expose some of the things that spark my interest or might spark theirs. It’s already prompted at least one story idea. See my comment above about the charter school bill. That is even before we’ve really started promoting it. As I start telling people on my beat about it and regularly promoting it on the schools page, in print, etc. I hope it will become more useful — for me and my readers. I still have a long, long way to go to make this what I want. The blog is very much in its infancy. But so far, I’m already seeing the payoff, even if it sometimes come with the headaches. Unfortunately, many of the headaches are beyond my control. But where I can, I’m trying to come up with some other solutions/ideas to make it work. Since I know some of my readers here are beat bloggers themselves, I’d be remiss not to end this post with this plea: What mistakes did you make that I should avoid, and what are your best tips? Also, if you’re a beat blog follower: What posts get your attention? What could you do without? What would you want to read about your local schools/education? • I created a blog entry with every tag I’ve used so far and links to search for it. I will update that entry (dated to be the first entry in the blog) as more tags come into use. I also made a tinyurl for that entry (tinyurl.com/jcschooltags) and placed it in my “about me” section above the blog. Unfortunately, the profile section doesn’t let you actually create a link. So they’ll have to copy and paste it. I did put it as the top link in my “blog roll” — just under the most recent tags section. Jay Rosen of PressThink fame is writing an article for the Chronicle of Higher Education about why he uses Twitter. And as is only appropriate, he’s crowd sourcing his network to incorporate other users’ takes. He’s asking Twitter users, especially students and academics, to explain in 140-characters or less what makes the platform useful to them. Twitter expands my network, especially with locals and in journalism industry circles. Plus keeps friends, family up-to-date. You can tweet your explanation to him @jayrosen_nyu or reply on the PressThink post. Look through some of his replies so far to get an idea of what others are saying. On a lighter note. During my month hiatus, across my Twitterfeed came a site worth sharing with you all, or at least those who haven’t already laughed at it. Stuff journalists like. It’s brilliant, and for the most part spot on. I’m surprised it took so long to come to existence. It’s in the same tongue-in-cheek vein as Stuff White People Like, which sadly is also pretty funny. And we could all use a few laughs these days. Journalists like nothing more than to stagger back into the newsroom in the morning, not more than six hours after leaving the night before, to get an email from a reader on the difference between straitjacket vs. straight jacket – for the record both are correct. Four five years of higher education can’t even begin to compare to the infinite value of the feedback journalists get back from their loyal readers. [A]s good as seasons one through four are, it is season five that journalists really love. Going inside the Baltimore Sun’s newsroom for season five, reporters feel smug hearing terms like “main art,” “double truck,” or “below the fold.” Journalist like telling their non-journalists friends what these words mean, and that they really use those terms in their own newsroom. Seeing their work, be it ever so brief, releases that chemical in every journalist’s brain that ensures them they are ahead of 99 percent of the world when it comes to reporting on the presidential debate, hurricane or community bake sale. If I had to throw my own in there, I’d probably add, “complaining about other journalists” to the mix, especially about those working in another medium in your market. Maybe it’s not complaining so much as feeling superior to them, even if you have no reason other than that you can. At least, I assume this is something all journalists do, certainly it’s been my experience, but I’m young. Others I’d add to my list: Google, reverse phone look-up, charticles, election night and databases/Excel. To my more tongue-in-cheek list: conference calls, press conferences and man on the street interviews. What’s in my reporting arsenal? I’ve been getting several hits this weekend/today from some student blogs. From what I can gather, their assignment was to pick one of the 15 journalists’ outstanding personal sites at 10,000 words (for which I somehow made the cut) and link it to a lesson on backpack journalists. It’s kind of an interesting tie-in, because when I look at that list I see a broad spectrum of reporters, multimedia journalists and photojournalists but no one I’d necessarily classify as a backpack journalist in my understanding of the term. I definitely wouldn’t classify myself as one. Then, I started to think about the tools I carry every day, several of which are items you’d expect out of those who specialize in this stuff. But I’m more inclined to just think the modern reporter has more flexibility to choose her medium and methods of reporting, certainly that’s what drives what I carry or don’t. In particular, one of the posts said “I got an “old school” vibe from Miranda [sic] in that she seems to not do so well with modern technology …” I had to stifle a chuckle, because I think in my entire life this is the first time anyone has accused me of being old school. And as for not doing well with technology, behold this blog. Or the other bits of technology I carry with me everywhere. I’m kind of interested in where the idea came from (the other comments on the post backed it up they too got that vibe), but I’m not going to argue. I’d venture to say I’m one of the more technology-forward journalists I know personally. So I know better, and my regular readers probably do too. (I asked my Twitter feed and they agreed with me.) But it’s interesting I give off that vibe. My reporter’s notebook, and another small notebook to keep ideas. 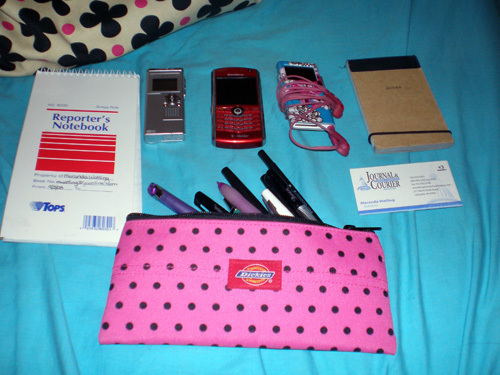 My Blackberry Pearl, on which I have actually written and filed stories/updates by e-mail from events. My digital camera, which does have video capabilities but I rarely use that because I do not do video for the paper. Business cards to hand out when someone needs to call me back or I want them to think of me for a story next time. My iPod because when I leave this county, the radio music selection drops to near zero. (BONUS: I can use the headphones on the digital recorder). Purell, because I shake a lot of hands and covering kids I’m exposed to a lot of germs. A granola bar, because you never know when you may be stranded at an assignment for hours. A bottle of Excedrin, because a splitting headache during a three hour meeting makes a painful process unbearable. Benadryl tablets, because being sent out to a field can induce a fit of sneezes or itchy eyes. An umbrella, because ink runs when it gets wet. Sunblock, because my skin is fair and you can’t predict when something will break that requires you to stand out in the blaring sun. A small first-aid kit, because I am accident prone and attract paper cuts or fall and gather scrapes. A lint roller, because some of my pants attract lint, and I want to present a professional image. Shout wipes, because I frequently spill my coffee. Gum, of several varieties, to hold me over when food is unavailable or keep me awake. An extra contact lense, because I’ve lost one and had to drive two hours home with one eye squinting. It sucked. What I don’t carry every where and most students assumed I do: My MacBook and the daily newspaper. As for the newspaper, I grab it every day and skim it. But by the time I see it in print, I’ve usually already read the stories, either the night before when my colleagues filed them or online that morning. The exception to this is Sunday newspapers, because I have more leisure time on Sundays and because I do not like to read big packages online. I’m not likely to carry it in my bag, however. And that my friends is a pretty good run down of what I do and don’t carry. I can’t speak to any of my equipment being the best, but I will say I’m satisfied with everything I have. I don’t have an iPhone but my Blackberry serves me well, and my digital camera isn’t going to take HD video or give you an amazing A1 shot, but when you need a picture in a pinch, it serves the purpose. My digital voice recorder, even without a mic it records better than most I’ve seen/used. And it’s tiny. One thing all this equipment has in common: It’s all small. When I roll with as much as I do, the smaller the better. Maybe someday I’ll consolidate it all into one tool, but for now, I’m OK letting each bit do its job. So, maybe I should start this as a meme. What’s in your bag?